Year/Month: Think of Calendars as being arranged hierarchically: the top view shows the entire year; tap a month and you move down a layer to see the entire month; tap a date to see the detail of a day’s appointments. Tap in the upper left corner to move back to a higher level: the month’s name to move from day view to month view; the year to move from month view to year view. 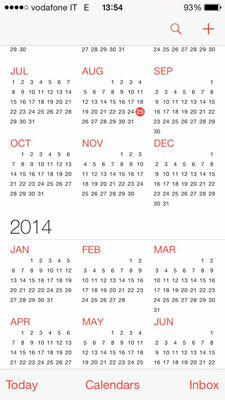 When in year or month view, scroll up and down to move to the past or future month or year. You can see the end of 2013 and the beginning of 2014. When in day view, tap a date in the week displayed at the top to move to that date; scroll up and down in the day to move between morning to evening hours and scroll left and right to move backward and forward in time to select a different day. All-day events are displayed between the week and hour sections. 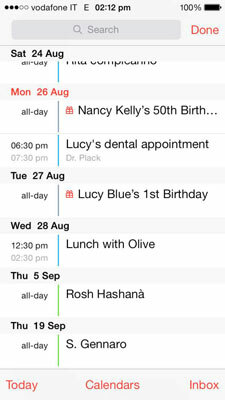 Notice the current day is in red (August 25) and the birthday is indicated by a gift icon. 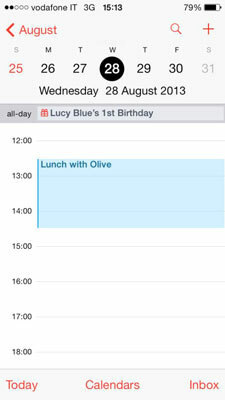 To view several days of your calendar together rotate your iPhone to landscape view and you see a multiday calendar. Swipe left and right to scroll to previous and upcoming days. Swipe up and down to scroll from morning to evening. All-day events are posted at the top of the day. Multi-day events are highlighted across all the days of the event. Multi-day view doesn’t work when you have the orientation lock turned on. To permit week view, drag up from the bottom of the screen to open the control center and tap Orientation Lock off. Drag down to close the control center and week view appears when you turn your iPhone to the horizontal position. Search (the magnifying glass icon): Opens the List view. You see five or six events. If you have a busy day, you may see only one day. If you have just one or two things each day, you see more days. The colored line to the left of the event corresponds to the calendar it comes from. You can scroll up and down this list to see what you did or what’s coming up. Tap in the search field at the top to look for an event. Calendar searches in the title, location, notes, and invitees fields of calendars that are active; if you don’t find an event, tap Calendars at the bottom of the screen, tap Show All Calendars, and then try your search again. Plus Sign: Tap this button to add an event to your calendar. Today: Tap on the Today button at the bottom of the page in any of the views, and today is highlighted in that view. Calendars: Takes you to the list of your calendars. Inbox: Shows invitations you’ve received from other calendars. The number in parentheses indicates how many invitations you’ve received. Click on the button and a list of invitations opens.